Orange pheasant feather toy by CatTamboo® Pet Toys are interactive cat toys made from wild ring-necked pheasant tail feathers and fluffy orange feathers. Tamboo Flyers® come with multiple options including the option to upgrade the rod and to add an additional peacock eye feather. Orange pheasant feather toys are Tamboo Flyers® with all natural Cat Flies™ that create an interactive experience. These interactive teaser toys for small pets are eco-friendly! 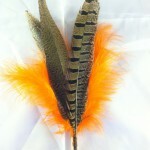 The orange pheasant feather toy has beautiful pheasant tail feathers and bright orange marabou feathers.